I have a large number of raster images. What I'd like to do is to compute statistics on different sections of these raster files using a polygon. I think everyone is suggesting Zonal statistics. However, I'd like to iterate through all the raster datasets and then store their statistics in a single table. Zonal statistics does this for one raster and then overwrite it next time. I used the %Name% inline variable as for my table name, but that just creates lots of tables. How can I iterate through all this raster datasets and create only one table? This still creates a long list of tables, but if they are stored in a 'disposable' geodatabase they can be deleted at the end as all the values are attached to the point file's attribute table. My previous answer had some issues as @Hornbydd mentioned! So here is the one that worked. I could even ran it without having the "Collect tools" inside the model and just used the "Append" tool. Are you able to keep the origonal file names in this set up? If you want to do this entirely within ModelBuilder you would create a model that iterates over your rasters, feed into a zonal stats tool and the output of that feed into a collects tool exposed as a parameter as shown below. This becomes a sub-model in a model that takes the collected tables and appends them into a single table as show below. Thanks @Hornbydd. I implemented your idea and actually combined the two models, and I got it to work fine. One should keep in mind that the receiving table must have the exact same attribute and column names as the iterative tables so each new table can be appended. Is there a way to retrieve input raster file names and save them in the final table? This is a big help since I cant exactly say which value in the table goes to which raster. Yeah, before you send your table to the collects tool put in an add field then calculate tool where the expression would be %Name%. I tried to add field and calculate to add a field of the original file names, but I have problems making it work. Can you maybe post a screen shot of that part? 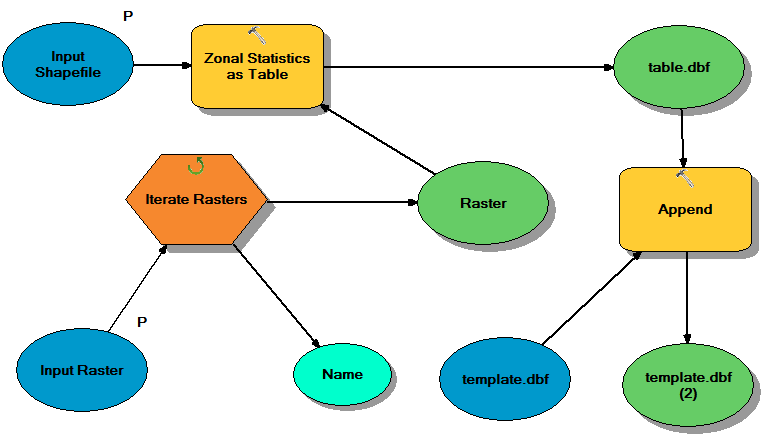 [SOLVED] Running zonal statistics on multiple raster tiles using QGIS? [SOLVED] Converting data in table created by Zonal Statistics as Table tool back into raster file?